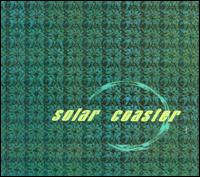 This self-titled debut from 1998 is Solar Coaster's only release to date. After this album came out, their label folded and the band dropped off the face of the earth. Once you get past the band's borderline cringe worthy name, this album will really hook you. Solar Coaster is the only band I've ever come across that has successfully blended shoegaze with punk rock. The result is 20 solid songs in less than an hour that often sound like something the guys in Swervedriver or Ride might have made if they spent a weekend slamming Red Bull and snorting speed. Hell yeah! This album owns face!